Russia needs to reinvent its economic engine, as the current model doesn’t offer appropriate sustainable growth or incentives, Russian Prime Minister Dmitry Medvedev has said. Russia’s GDP does not match its capacity or ambition he added. Russia’s economy is heavily dependent on oil and gas exports, and has taken a major hit since oil prices collapsed more than 60 percent since last June. On Tuesday both Brent and WTI dipped below $45 a barrel for the first time since 2009. Oil is Russia’s main export earner, as well as contributor to the national budget. 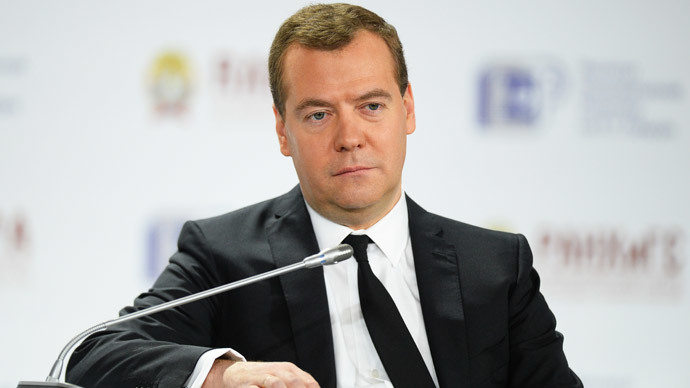 Medvedev said the Russian government will increase support for non-oil industries such as information technology, nuclear energy, aviation, and space. “Russia is a global leader in information, technology and communications, but these industries take the back seat to energy giants and financial corporations. This is indeed a global trend,” the Prime Minister said. While Medvedev served as President from 2008-2012, he advocated for technology and start-ups, and established the Skolkovo research center outside Moscow to host innovation in these fields. “We have our own ‘success stories’, and we are able to replicate them,” Medvedev said. On Tuesday, the World Bank revised Russia’s GDP forecast, predicting the economy will shrink 2.9 percent in 2015, compared to a 0.7 percent contraction it expected in December. This compares to the Central Bank’s ‘doomsday’ scenario of a 4.5 percent contraction in 2015. Up until last year, Russia’s economy enjoyed a relative period of high growth, expanding 3.6 percent in 2013. The government estimates GDP in 2014 only grew 0.4 percent. The Russian economy has been battered by geopolitical tensions in Ukraine, falling oil prices, and sanctions imposed by Western countries.